I’m taking a break from posting pictures of New Zealand to explore another, hotter, closer destination – Cuba. 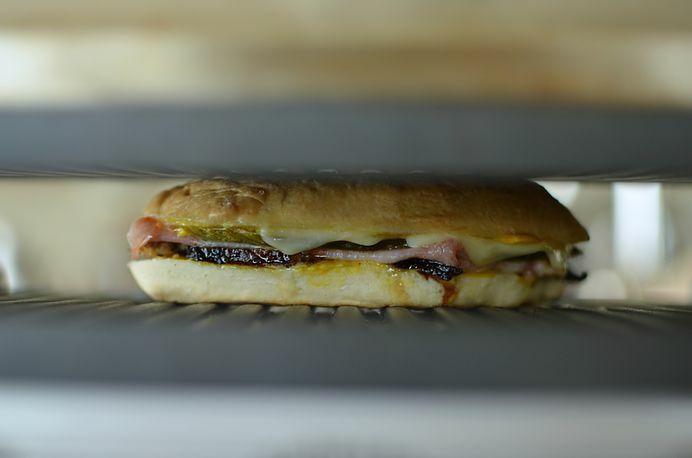 Here’s a recipe for a really delicious Cuban sandwich- a good kick off to my trip to Cuba (where ironically, I did not have a single Cuban sandwich). Part of my preparation for my visit to Havana included beefing up on my Cuban history and culture, re-reading some favorite Hemingway, listening to my Spanish language apps and watching the movies Motorcycle Diaries and Chef (for the food of course). 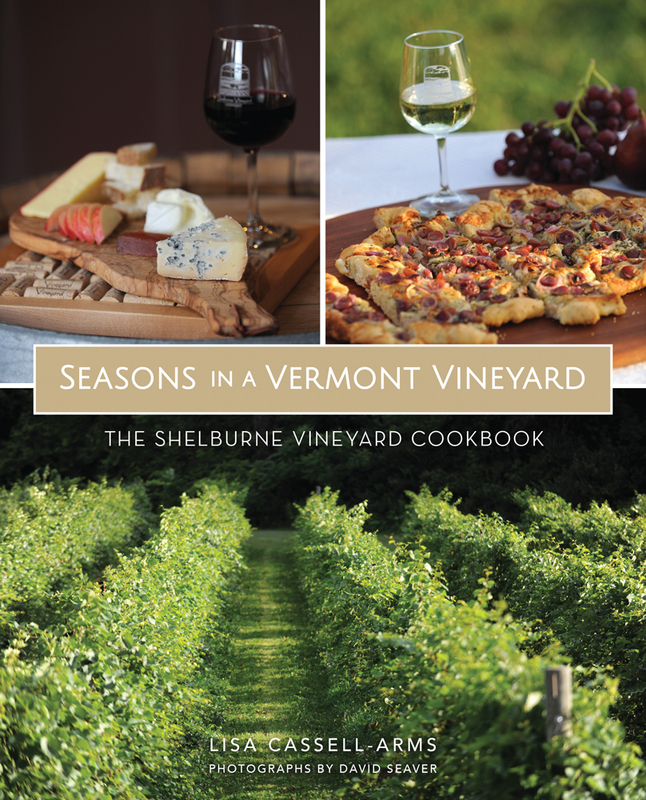 Then I got lost in a fabulous book a friend sent me – The Cuban Tableby Ana Sofia Pelaez and Ellen Silverman, a wonderful book that explores the rich culinary history of the country with great recipes and cultural insights. Watch for my next post with my photos and impressions of Havana. You can use any type of bread you want for your Cuban (focaccia, baguette, potato roll..) just make sure it is soft enough to flatten out when pressed in a grill. I decided to give a shot to making a traditional Cuban bread with lard. The bread recipe came from King Arthur Flour. Slather yellow mustard inside top and bottom half of each roll, then layer each with 1 slice pork shoulder, 2 slices ham, 2 slices pickle, 2 slices cheese and season with salt and pepper. Put sandwich together and brush top and bottom of sandwich with soft butter. Press in hot panini press or hot cast iron pan (using another heavy pot on top to press sandwich down). Press and cook until cheese is melted and bread is golden. Serve immediately. 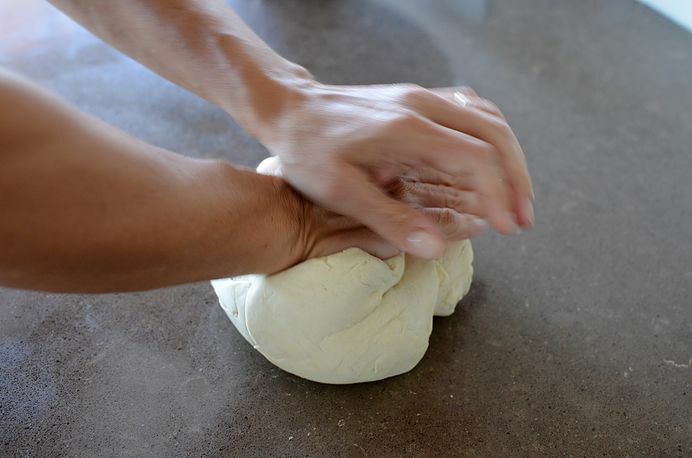 Combine the ingredients as directed at left, using a flat beater paddle or beaters, then switch to the dough hook(s) and knead for 5 to 8 minutes. 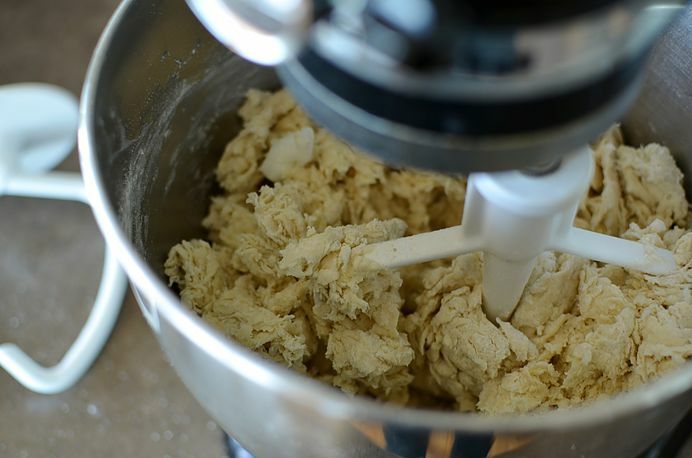 Transfer the dough to a lightly greased bowl or dough-rising bucket, cover the bowl or bucket, and allow the dough to rise for 30 minutes. After 30 minutes gently fold the dough in upon itself and turn it upside-down. Let the loaves rise, covered, for 1 hour. 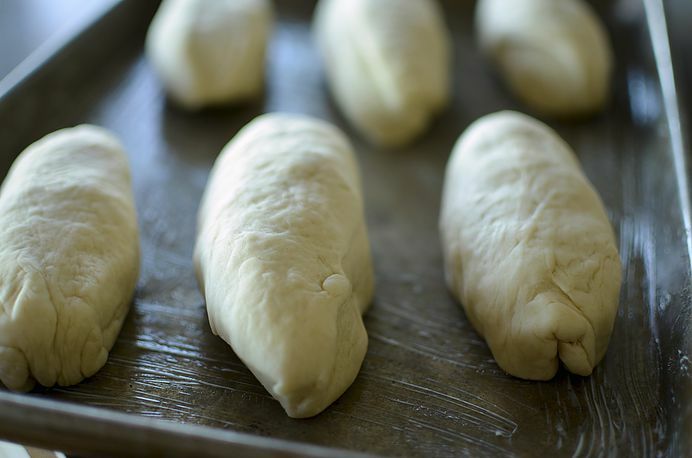 Brush or spray them with water, and slash one long lengthwise slit down the middle of each loaf. Preheat the oven to 375°F while the loaves are rising. Bake the bread for about 30 minutes, or until it's golden brown. Remove it from the oven, and cool it on a rack. The loaves may be made one day in advance and stored at room temperature, or several weeks in advance and frozen. Yield: 6 sandwich loaves. 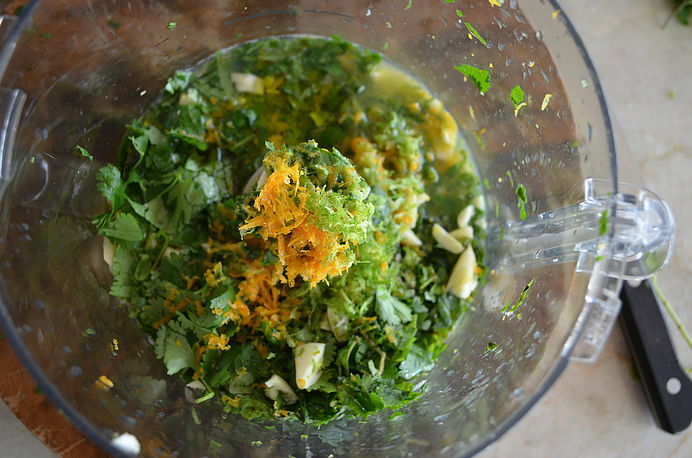 Combine the ingredients for the marinade in a food processor and process until smooth. Place the pork shoulder in a large plastic bag and add the marinade. 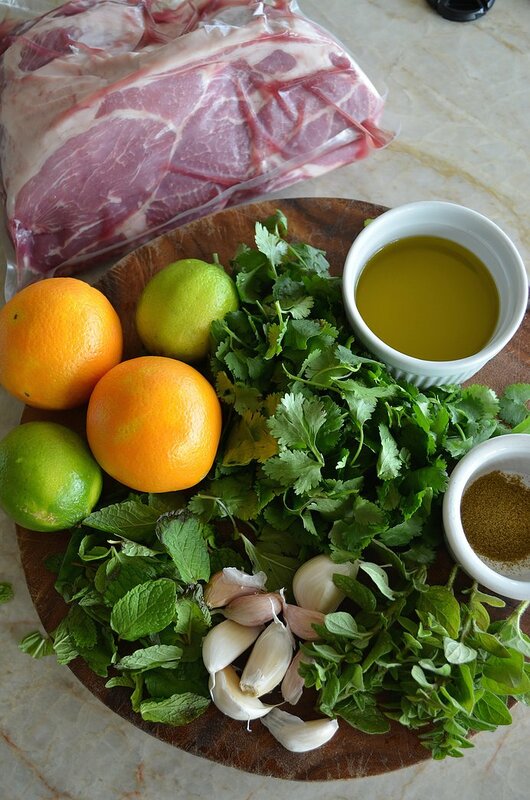 Massage until the pork shoulder is covered in marinade and then refrigerate overnight. Bring the pork to room temperature. 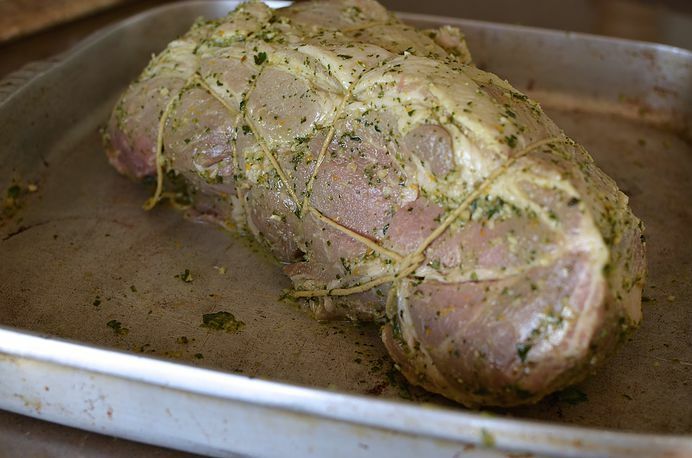 Tie up with kitchen string so that the pork shoulder is compact and even. Place in a roasting pan, skin side up and cover with foil. Roast for approximately 7-8 hours or until internal temp reaches 190 degrees F. Remove from the oven and let the pork rest for about 20 minutes before slicing.